It’s the spring of 1922 in New York City, a decadent playground of shifting morals, glittering jazz, bootleg empires and skyrocketing stocks. Chasing the American Dream, would-be writer Nick Carraway (Golden Globe nominee Tobey Maguire) arrives from the Midwest only to land next door to Jay Gatsby (Oscar nominee Leonardo DiCaprio), a mysterious millionaire whose estate overflows with endless parties. As Nick’s beautiful cousin Daisy (Oscar nominee Carey Mulligan) and her blue-blooded husband Tom Buchanan (Joel Edgerton) fall into Gatsby’s orbit, Nick bears witness to a tragedy of impossible love and incorruptible dreams. Based on F. Scott Fitzgerald’s timeless epic, The Great Gatsby mirrors the struggles of modern times in a dazzling visual journey from the mind of Baz Luhrmann, director of the Oscar-winning 'Moulin Rouge'. The 'The Great Gatsby' competition has now closed. Winners will be announced shortly. Competition opens at 5pm AEST on Sunday 29th September 2013 and closes at 11:59pm AEDT on Sunday 6th October 2013. Five winners will be chosen at random on Monday 7th October 2013. To successfully win, entrants must fulfil the above entry conditions before the time the competition closes. Current members/followers are eligible to enter the competition. Only one entry per person. Only one winner per household. To be a valid winner, the entrant must not have won a prize from SWITCH within the last 28 days. 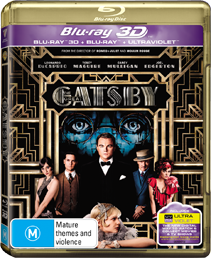 Each winner will receive one Blu-ray 3D copy of 'The Great Gatsby'. By entering, you agree to receive occasional emails from SWITCH in the future. If you decide to unsubscribe from these updates, any further entries will not be applicable. Only Australian residents are eligible to enter. 'The Great Gatsby' is available on Blu-ray 3D, Digital Download and Ultraviolet DVD on Friday the 27th September 2013 from Roadshow.